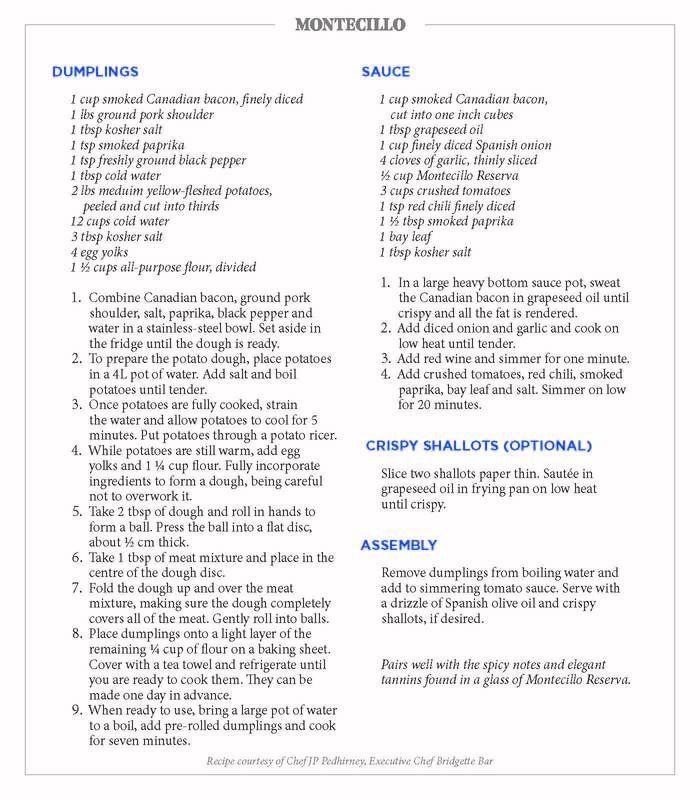 A fun change from your typical meat and potato recipes, these Acadian potato and pork dumplings are everything you want from your favorite kitchen staples. 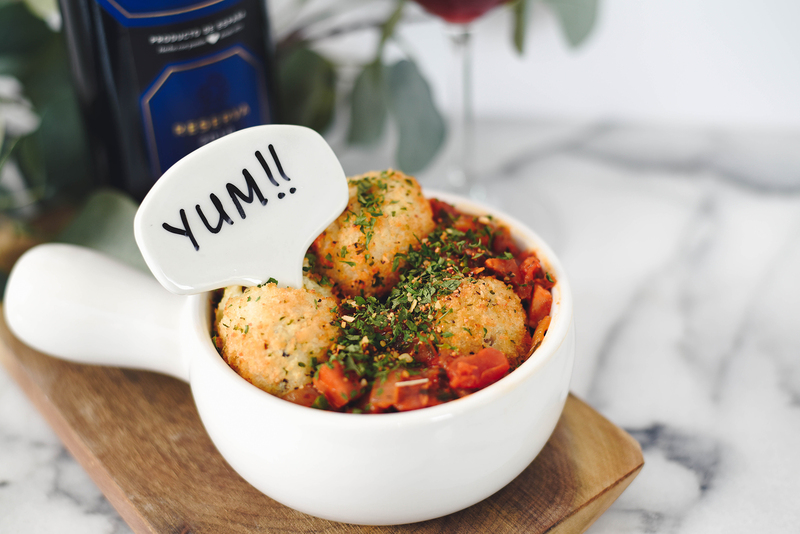 Stuffed with smoky bacon and served in a savory wine soaked tomato sauce, these potato dumplings are perfect for a cozy meal on those chili fall evenings. And always a bonus, you can totally make them ahead of time. With the cooler temps settling in, it has me craving ALL the comfort foods. And what says comfort more than a beautiful glass of red wine, and your classic: meat and potatoes. And can we talk about how fun it is to cook with wine? 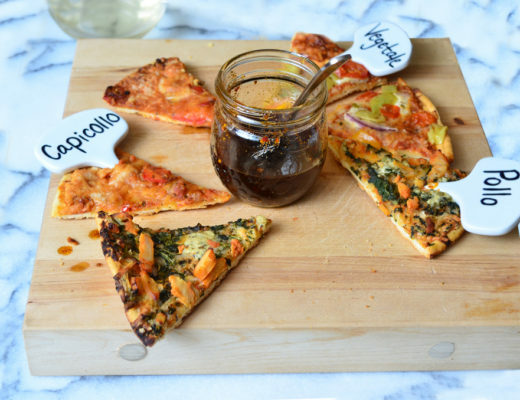 I mean a little for the recipe, a little for your glass: it’s a win-win. It’s a no brainer right, when your recipe calls for wine you clearly serve that wine with your dinner. I mean, is there anything more fun than cooking with wine. 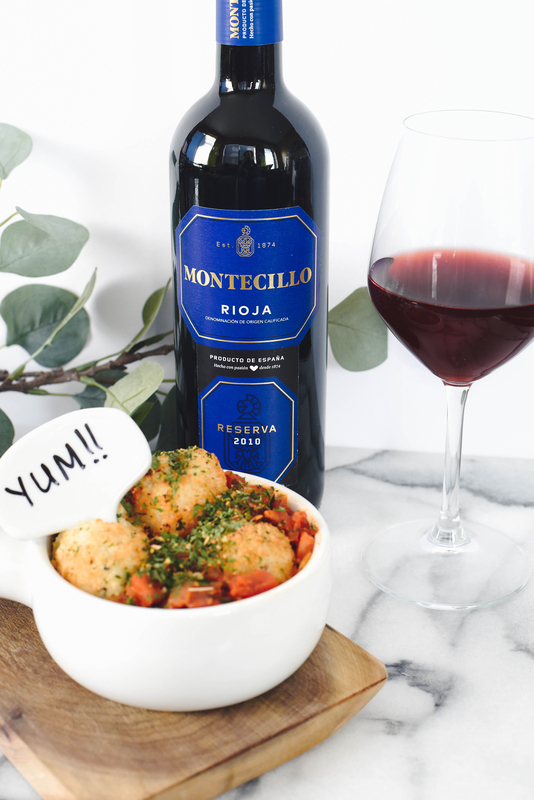 If you’re hosting guest you might want to pick a few extra bottles of the Montecillo Reserva lol Because once you add a little to your recipe, and more to your glass: things could get a little wild. 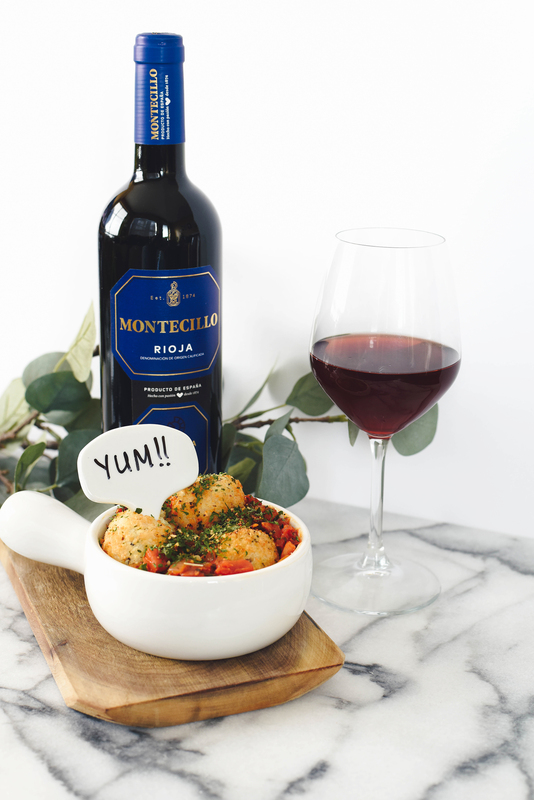 So we’re back with another wine and food pairing, and today we’re sharing this delish recipe for Acadian Potato and Pork Dumplings to pair with my favorite of the Montecillo’s wine, the Reserva. 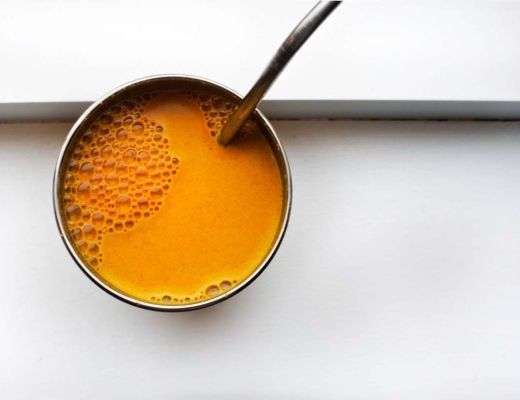 As promised, this is my part-two of my previous blog post (read that previous recipe here). Due to my previous experiences with dough (also known as, my failed attempts – let’s just say I once made 3 batches of biscuits to come to find out my oven wasn’t hot enough and I didn’t place them close enough together). Needless to say, dough scares the bejesus out of me, but there was something about using potatoes that didn’t seem to intimidate me as much. Maybe it was wine talking, but I had an odd sense of confidence with this recipe. I followed the recipe below exactly (who am I to question the professionals), but I don’t have a potato ricer, so I just used a cheese grater. What can I say, ‘I get by with a little help from my friends’ – i.e. the internet. Bless you. Clear and bright coloured. Intense cherry-red with a brownish red edge. Spicy tones, vanilla y black fruits combined with a hint of liquorice and mint. A good structure and elegant tannins with a long aftertaste. To accompany red, grilled or barbequed meat and any type of stews, including slightly spicy dishes. It is a fresh wine with a certain potency, due to which it combines perfectly with a wide range of cheeses. Serving temperature: 18ºC. 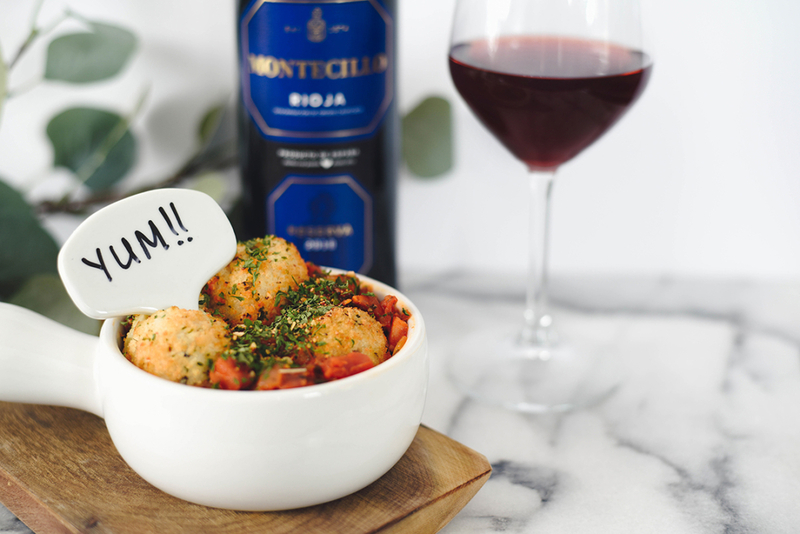 So if you love the Montecillo Reserva as much as I do, and you’re looking for any excuse to create a complimentary recipe to serve it. This recipe is for you. Special thanks to JP. 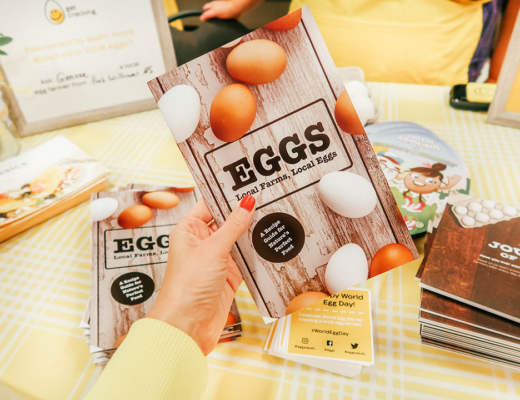 Pedhirney, Executive Chef Bridgette Bar for creating this super delicious recipe. What are you favorite red wine food pairings?? *This post was sponsored by Montecillo; however all opinions expressed are my own.